Select command is used to collect date from the table. We will discuss more on this by adding more commands to this select command. 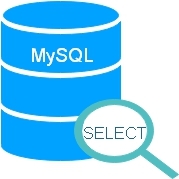 If you have not created the tables then please go to sql introduction page to use the sql commands to create the tables and fill the table with some records ( data ). That's all to get all the records from the table student. We have not placed any restriction here and asked for all the fields with all the records. Now if we want to restrict our results and get only name field from the table. This will return only name field from the table. We can ask for more fields and all field names we have to separate by comma. We can include as many field names we want from a table. This command with LIMIT command will return us 3 records starting from 0 ( or first ) record. This is very important when we use this command with ORDER BY command. Now let us try to list all the students who have come in first 3 ranks. We are required to list here 3 records who have mark more than the others. The top 3 students we want to display in order of first, second and third. The order we can display are in by default in ascending order but we require the listing should return in descending order so we will get the highest ranked student at the top. Before that let us start with a simple example of ORDER BY command. This will display the records of students in the order of lowest mark to highest mark. We will change it to display in reverse order so it will display highest mark at the top and lowest mark at the bottom. With the addition of command DESC we can change the order of display to keep the highest mark at the top of the list and lowest mark at the bottom of the list. Now let us add the LIMIT command to display only the top 3 records. We already have the list in the order of highest mark to lowest mark so by just limiting the number of records to 3 will give our required top three student records. This is the SQL query which will display top three students based on the mark they scored. In the next section we will use sql WHERE clause to restrict or filter the records. We can use CONCAT function to combine two columns and displaying them as one column. For example we can combine first name and last name and display them as Name. We have to first connect to database using PHP PDO. Then we can display the records by looping. Here is the sample code to display 4 records. However any other query can be used and matching records can be displayed. How to get ( select ) data from more than one table ? how to get 200 characters/letters from a long description and to be followed by "..."
You can display by using above code or to display first 10 you can use LIMIT query. By adding Order by to the query you can display in the order of highest to lowest or alphabetically or in any other combination. smo:::How to get ( select ) data from more than one table ? To select data from different tables, you have to link them. Here is the tutorial on how to link more than one table..
in last example .. what is $dbo?? It is declared inside config.php file where all database connection details are kept. The link is there also.